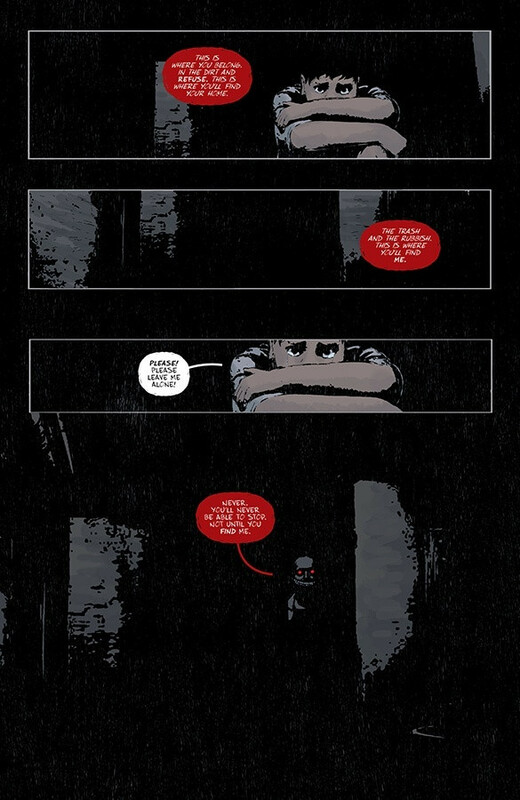 THIS REVIEW OF ‘GIDEON FALLS’ #1-8 CONTAINS MINOR SPOILERS. by Brendan Hodgdon. There is nothing quite so thrilling as seeing a creative team brought together on mainstream titles extending their collaboration into the creator-owned realm. The prospect of these creators feeding each other’s best instincts to create original and unique work is always exciting, particularly after seeing them previously work under external demands. 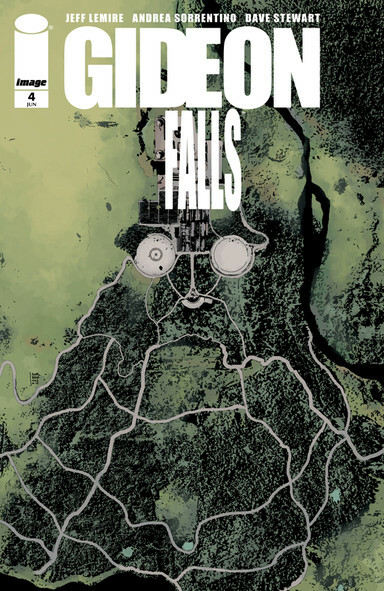 As pointed out by my esteemed Imagery predecessor Courtney Ryan in her great review of issue #1, such is the case with Gideon Falls and its creative team of Jeff Lemire and Andrea Sorrentino. And now that their disturbing original series with colorist Dave Stewart and letterer/designer Steve Wands has reached eight issues, we have a wonderful, extended sample with which to judge this ultimate work of theirs. 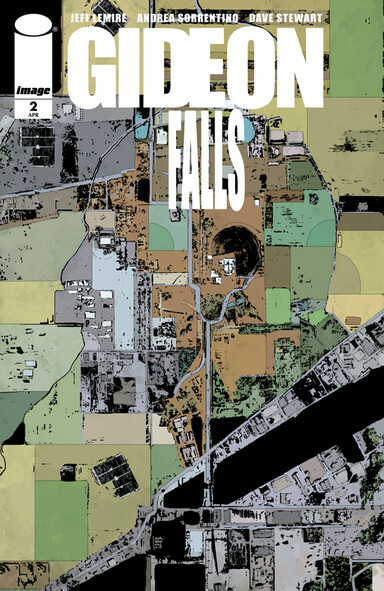 Thankfully, Gideon Falls has not only lived up to the promise shown in that first issue we reviewed earlier this year, it has surpassed it. With each issue, Lemire, Sorrentino, Stewart and Wands have ably expanded on their world, characters and story, and as each new layer has peeled away it’s revealed more mystery, more suspense, and more artistry than the last. 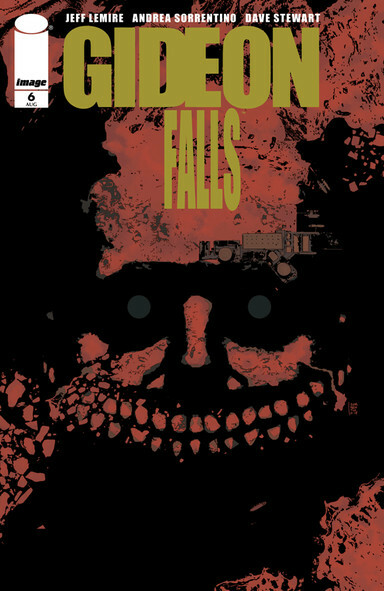 Gideon Falls is a tremendous piece of work from the top to the very, very dark bottom. Letters & Design by Steve Wands. Life Goes On and On and On. 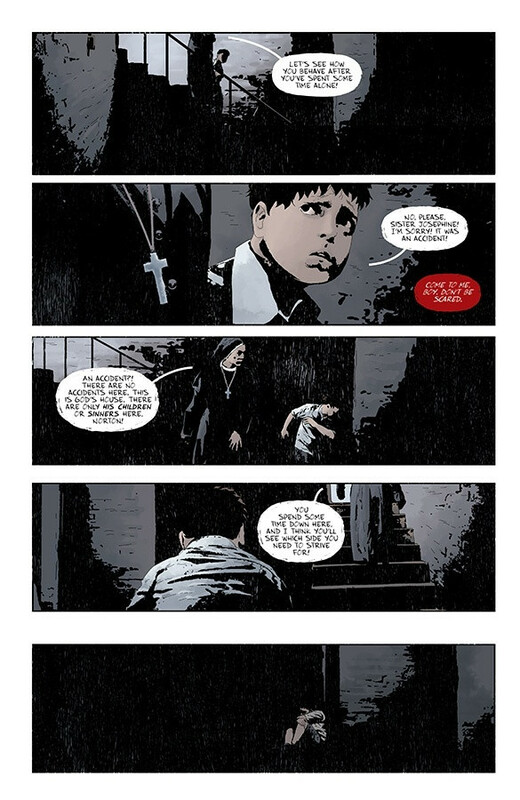 When Gideon Falls first began, it maintained a tight focus on its two lead characters, a troubled young man named Norton and a bitter priest named Fred. 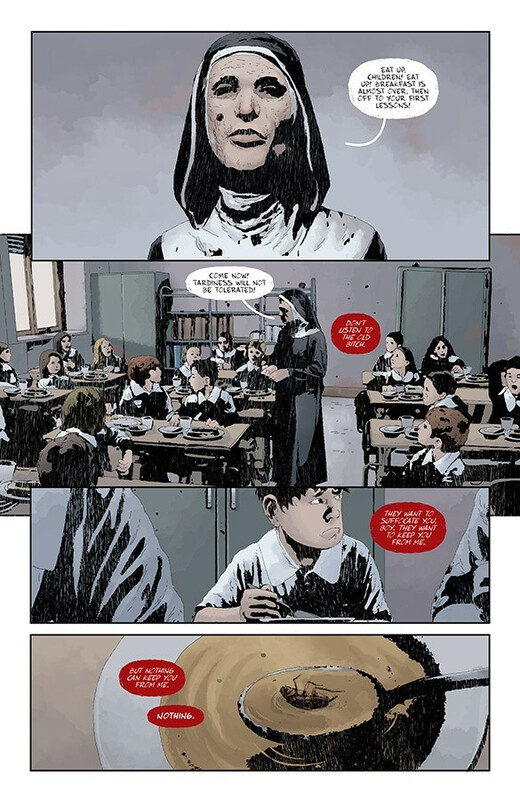 And while Norton and Father Fred remained the central focus points of the series, as the story progressed Lemire expanded his reach to encompass more and more characters. Figures like Norton’s therapist or the local sheriff could easily have been anonymous filler in the story, there solely to be sounding boards for our leads, but Lemire’s story is more expansive than that. 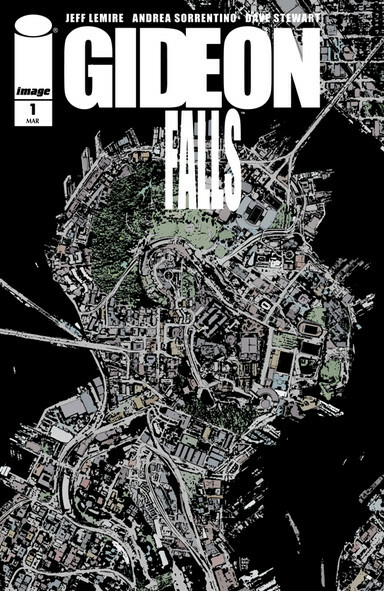 As befitting a title named after an entire town, Gideon Falls has steadily woven into a larger tapestry. Through all of these additional viewpoints the series provides a greater, more horrifying examination of what these people are all up against, and the damage that the mysterious Black Barn can do to the world of this series. In addition to the expanding scope of the narrative, Lemire has also opened up the chronology as he goes along, particularly in the first two issues of this second story arc. (Issues #7 and #8.) Characters’ backstories are examined more directly through flashbacks, and this variety in the storytelling, in addition to driving home the series’ existential danger, gives Sorrentino opportunity to play around stylistically. Perhaps what is most interesting about Gideon Falls so far is that the two co-leads have yet to interact much at all. This works both in the unpredictability of the story and that it isn’t something that you notice much at all through the first 7 issues. Norton and Father Fred’s stories are each so engrossing and functional unto themselves that it doesn’t even register that they are barely related to each other — at least until the first connections are made between them in the most recent issue. Now that the possibility of them crossing paths has been broached, it will be fascinating to see where that thread may lead in future issues. Wonderful Dreadful Art. Throughout the series thus far, the entire art team has been on fire. Sorrentino, Stewart and Wands are working beautifully together, employing an impressive range of techniques and stylistic tricks. 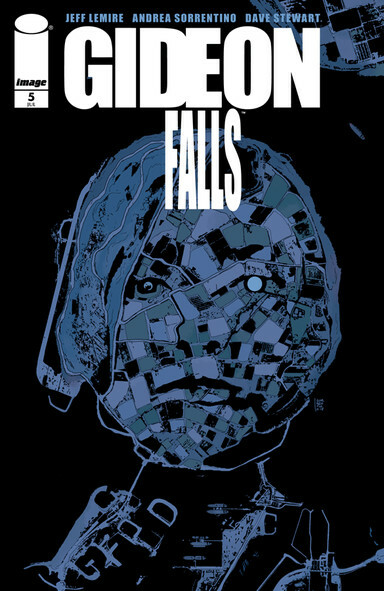 Their work on this series walks a fine line between making Gideon Falls a tangible, real place and depicting the unknowable supernatural otherness that lurks beyond it. For the most part, the art of the book is marked by stark depictions of banal rural scenery and dingy urban backdrops. Sorrentino’s grounded approach to this is supported by Stewart’s drab, desaturated colors, which highlight the oppressive presence that hangs over everything in the story. The panel layouts are often very formal and intricate, particularly when taking us into Norton’s obsessive mindset, and Wands’ lettering is just as carefully positioned to help define the pacing of the page. And then, as the surface reality is shattered by the series’ evil presence, everyone takes things up several notches. Particularly at the end of the first volume, and again in issue #8. Sorrentino, Steward and Wands have used everything in their arsenal to dramatize something as yet incomprehensible, and in the process have provided a singularly dread-inducing narrative experience. In these moments, the closest aesthetic comparison I could think of was the stargate sequence in Kubrick’s 2001: A Space Odyssey. But unlike the mind-expanding wonder of that cinematic gem, these sequences leave the characters (and the reader) adrift in an existential void, emphasizing the unsettling tone that echoes back to the surface reality of the series. The Slow, Hot Burn. 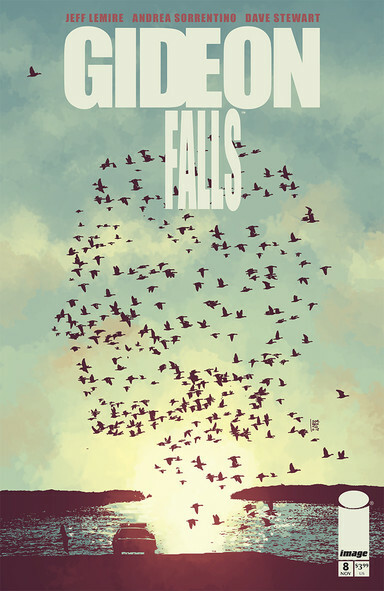 Gideon Falls is certainly not a book that is in a big hurry. Lemire, Sorrentino, Stewart and Wands are taking their time with this one, avoiding latching on to easy genre framework in favor of letting the characters and the tone set the stage for what they’re doing. The first volume ultimately functions as a murder mystery, but only in the abstract; it is clear from the beginning that the killer they are looking for is relatively inconsequential in comparison to the mystery of the Black Barn itself. The way that the creative team teases out new questions and angles, often in concert with the aforementioned expanding scope of their dramatis personae and the overall chronology, is what keeps you engrossed in the book. Indeed, the steady, deliberate pace of the series directly feeds into the haunting tenor of the story. The longer the mystery goes unanswered, the more characters who get dragged into it, the more we see of this bleak little town and the mind-melting darkness beneath it, the more intense and frightening the whole series becomes. 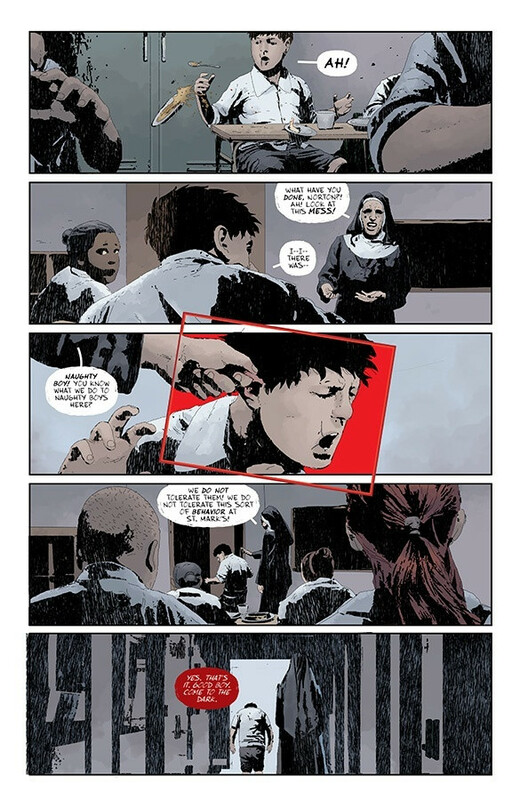 Lemire & Sorrentino are displaying an immense amount of patience in how they lay this whole thing out. It pays off more and more with each new chapter. Image Comics has no shortage of great ongoing series at the moment, and Gideon Falls is certainly one of the publisher’s best. The creative team is firing on all cylinders, and with eight issues in the can they have yet to miss a step with this gothic masterpiece. 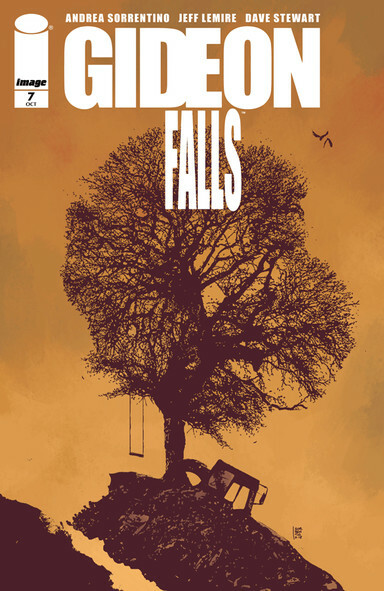 At this point there is more than enough evidence to declare Gideon Falls a can’t-miss series; it would be best to get in on this title now, before things really start getting weird. Check out this four-page preview of the latest issue of ‘Gideon Falls’ (issue #8), courtesy of Image Comics! 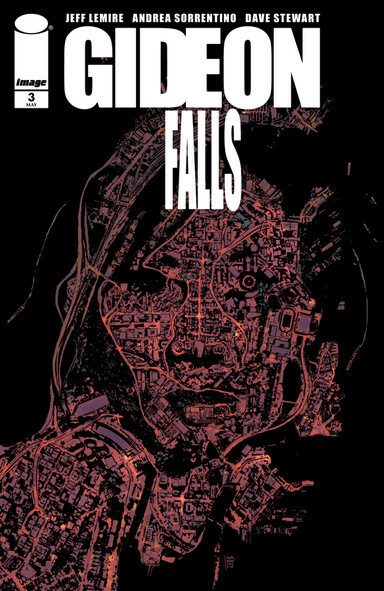 ‘Gideon Falls Vol. 1’ and issues #7 & 8 are available from Image Comics now.